▶ SoldThis listing was sold on Apr 5, 2018 for the price shown here. NEW PRICE! LINDBERGH SCHOOLS- A Fischer & Frichtel built home in much desired Canterbury Farms. Enjoy this spacious family home located on a quiet cul-de-sac. 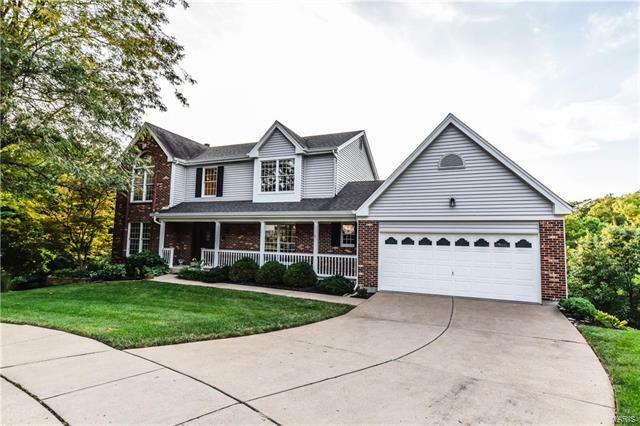 Real wood oak flg., ceramic tile, new appliances, new 2nd floor carpet, 9' ceilings, crown molding, large 5-window bay & F/P flanked by custom bookcases. New maintenance free siding, newer roof, oversized water heater. zoned htg. & cooling, Anderson WOOD windows, Granite countertops, inground sprinklers, covered front porch, Huge new composite deck off main level enhanced by mature trees & wooded oasis. The double size deck has Maintenance free railings as well & is covered for your total enjoyment. Enjoy the newer open floor plan carpeted L/L w/wet bar, game room area & media area Full bath & plenty of storage. Walk-out to a second new composite deck plus a separate patio. This home was designed for great memories! A real plus-great neighbors & easy hwy. access with an abundance of shopping nearby. 270-S on Tesson Ferry Rd. (21) - R on Bauer Rd. (just past YMCA) 1st R entering Canterbury Farms - R to Tammy Kay - home in Cul-de-sac.